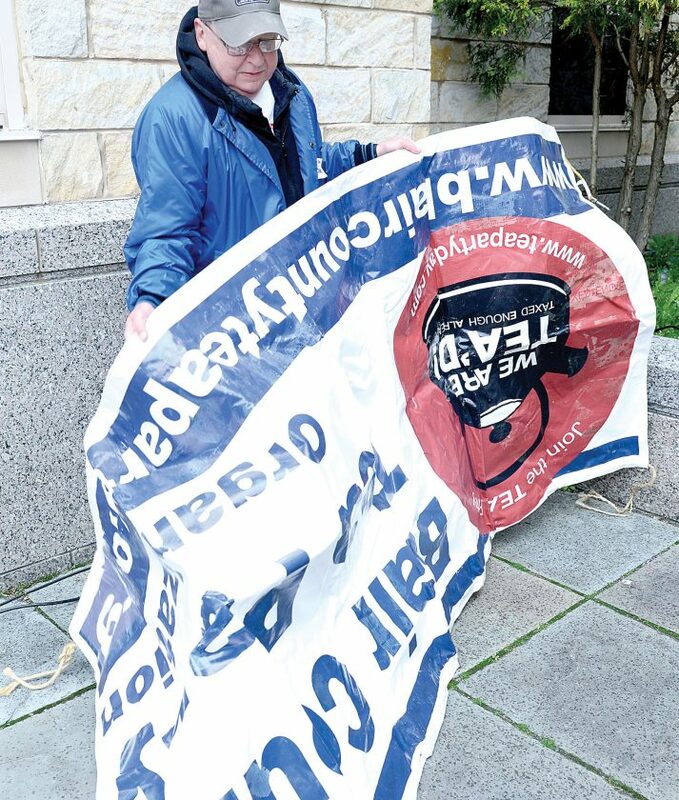 Mirror photo by Gary M. Baranec Don Keller, a member of the Blair County Tea Party Board of Directors, folds up a banner the group used during a rally at the Blair County Courthouse on Monday. HOLLIDAYSBURG — The Blair County Tea Party marked its 10th anniversary Monday with a rally on the courthouse patio, the same location where the group assembled a decade ago. While the original event drew about 400 people and Monday’s drew only about 20 — both on cold and damp weather days — the group’s cries for liberty and less governmental intervention remain the same. “Our government exists to serve we the people, not the other way around,” retired state Rep. John McGinnis of Altoona told those at Monday’s rally. Gun rights are always under attack, so be vigilant, Sheriff James Ott reminded the group. “We want our law-abiding citizens to keep the weapons they’re allowed to have,” the sheriff said. The theme developed from President Donald Trump’s State of the Union address when he declared that America will never be a socialist country, Jenny Beth Martin, co-founder and national coordinator of the Tea Party Patriots, explained in statements about the pending rallies. Halvorson acknowledged that capitalism isn’t a perfect system and that reforms are long overdue. But he also urged everyone to embrace Trump’s declaration that America will never be a socialist country. “Electricity,” he said, generating laughter. When Blair County hosted its first tea party rally in 2009, attendees came with signs that included “Hey you Gov, You work for U.S.,” and “Washington, please leave us alone.” One man came with tea bags wrapped around his ears. Those at Monday’s rally had no signs and or tea bags. But they dressed in coats, gloves and hats to remain comfortable during the half-hour rally. McGinnis said the Blair County Tea Party, in the last decade, has embraced a mission of trinity of spirituality, education and politics. Mirror Staff Writer Kay Stephens is at 946-7456.